What is CPC or PPC? In Manual Cost-Per-Click (CPC) bidding, mostly you are able to set a maximum price upon the cost of someone clicking on your AdWords ads. Tip: You could be able to acquire good value with this bidding method as you have to pay only when a viewer is adequately interested to click your ad though. How does Manual CPC bidding works though? According to you if it’s worth 19rs to spend for someone to visit your website, you can set 19rs as your max. CPC. You will only need to pay a maximum of 19rs if a person reads your ad and also clicks it, or else you will have to pay nothing if they don’t click. Now suppose, you created a text ad and also you set a max. CPC bid equivalent of 19rs. Then, when 500 people just viewed the ad, but 23 of them click on ad to learn more, you will have to pay only for those 23 clicks. As you had set max. CPC bid as 19rs, you’ll pay nothing extra than 23 clicks x 19. Most probably you’ll pay less than your max. CPC since with the AdWords auction, the greatest you’ll pay is what’s minimally needed to hold your ad position as well as any ad formats displayed with your ad, like sitelinks. Maximize Clicks bid strategy sets your bids automatically in order to help in getting as many clicks as possible inside your budget. Although here you will only need to set a target daily budget and also the AdWords system will handle the rest. What it will do is, it will automatically set your maximum cost-per-click (CPC) bids for you, most probably with the aim of getting you the maximum clicks possible within that budget. This type of bid strategy mostly will adjust your manual bids automatically in order to help you get many conversions, by trying to reach the same cost-per-conversion. ECPC is offered as an optional feature along with Manual CPC bidding. While using ECPC though, you’ll still have control on your bids just the way you did before, but ECPC helps you by adjusting each bid according to how likely it is that a click will result in a conversion. Only if a click appears likely to convert, ECPC will automatically increase your max CPC (after applying any bid adjustments you’ve set). An advertiser’s actual CPC is calculated by dividing the AdRank to hit (the AdRank of the competitor below them) by their own Quality Score plus $.01. Mostly the least positioned ad will be the minimum price suggested by Google to show on the Adwords page. From the example above you can discover that, since the quality score of Advertiser C is the least, he needs to pay more amount order to beat Advertiser E.
Most crucial point to remember is that the quality score says a lot in this. From the example below you can discover the value of quality score. 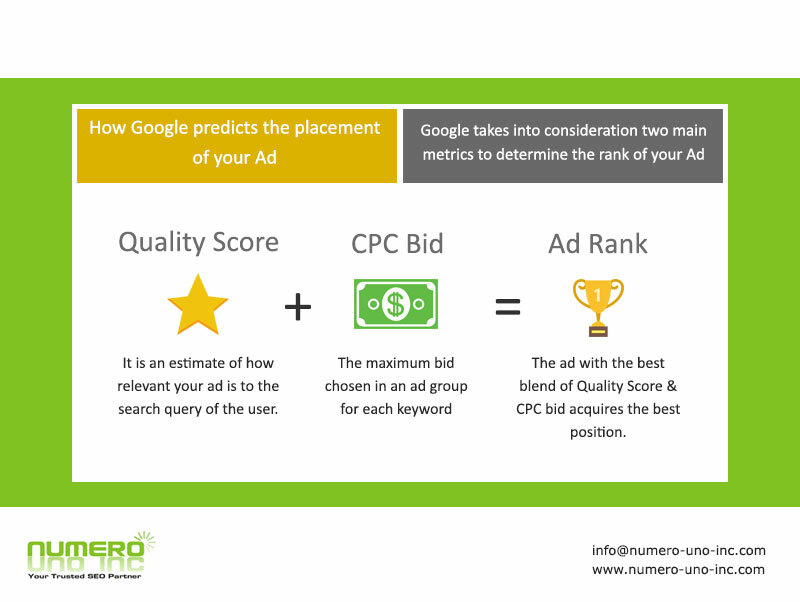 By increasing the quality score, the ad rank will also increase automatically in order to hit the top positions. In the table below, Advertiser B has increased their Quality score and also check how his rank increased to hit the top position. Though Quality Score is important and also essential way to reach the desired top positions and decrease your costs. Most importantly in order to become a Adwords expert and to have a success with Adwords, you need to improve your CTR, the relevance of your Ads, quality of your landing pages as well as the speed of the landing pages though. 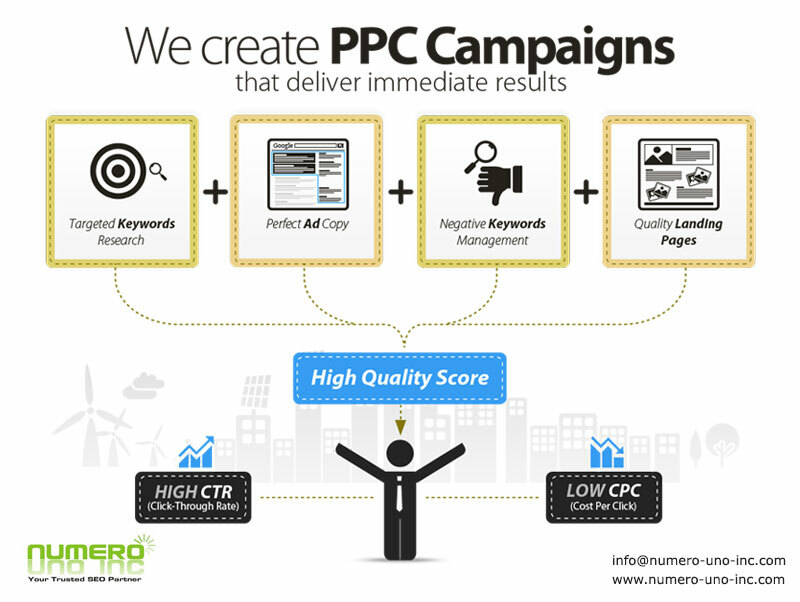 Please note : Numero Uno is a leading PPC management firm in Mumbai. We manage your Google Yahoo Bing PPC account across the world to generate maximum leads & also conversion. This entry was posted in Adwords, CPC, PPC, SEM and tagged cost per click, google adowrds, pay per click, quality rank. Bookmark the permalink. Thanks a lot for your valuable feedback ! I simply desired to thank you so much again. I am not sure what I might have created without the actual opinions discussed by you relating to this field. It seemed to be a very frustrating circumstance in my view, however , taking a look at your expert strategy you solved it made me to jump over joy. Extremely happy for this service and thus hope you find out what an amazing job you are accomplishing teaching other individuals through the use of your blog post. Thank you. Glad that you found this article useful. I do agree with all the ideas you have presented in your post. They are very convincing and will definitely work.Thanks for the post. Glad that you found the posts useful. I can surely say that this is a perfectly composed post! . Perfectly written content, thanks for entropy. glad to be one of the visitants on this awe inspiring web site. Absolutely excellent article, thankyou for entropy.